If I had a drone I’d take some updated pics of the Laney site. Instead, here are some Google Earth 3D renderings looking south, east, and north. As this is more-or-less informed speculation on the mayor’s part, I’m going to hold off on major posts until the A’s announce (or leak) something. Could lake Merrit be visible from the upper deck if the ballpark is facing east on the Laney site? The pics I posted are from 80′ elevation. They should be able to see the lake, yet I couldn’t make it happen without going much higher. What would happen to Laney College? Would that move to another location? Snow Park, people. 19th and Harrison. Kaiser Center looming over the left field wall. Lake Merritt running along almost the entirety of the outfield wall. It would be nice, but given Lake Merrit’s status and iconic statue in Oakland there would be howls of protest. I don’t think it’s really big enough, is it? I am completely down with anything around Lake Merritt. That is a gem of a spot. This seems like pretty substantial news to me. Narrowing down to two sites; in either a downdown lakeside location or by JLS… I get it that it’s the mayor and not the A’s who let that out, but I cannot imagine her saying that w/out the A’s wanting that info to be leaked. The A’s haven’t denied it, have they? I guess “substantial” is a bit of a subjective term. I don’t consider this substantial. I consider it a politician putting out a message that she’d like to be the lede. She isn’t sharing anything really new, I think we all knew that Brooklyn Basin was on the fast track to nowhere. The Coliseum is their fallback, and until something else is progressing it can always come back. That leaves us with two sites, that the A’s have spoken about publicly, to ponder. First, I should say… I agree with your assessment of Schaaf. She has been way more dialed in. She isn’t just floating bulldung to make headlines… I also believe that she honestly wants the A’s to get something done in Oakland AND that she is genuinely behind whatever works for the team. She’s been bullish on both for a few years now… no? Also, she has made it clear that she doesn’t want the A’s at the Coliseum site. If I’m not mistaken, I believe that the street infrastructure between JLS and Laney for both walking and vehicular traffic is much better and easier than between JLS and HT. If it is at Laney (HT. or Laney would be fine with me), I hope they can design it in a way that incorporates the lake channel into the side, front, back, or wherever potations of the ballpark, that would be so cool. On a side note, if the A’s do choose either one of these sites it would be a bit ironic that Davis said the A’s being at the coliseum was part of what was making it to difficult to build there. well those associated with the college aren’t too thrilled about the possibility of the a’s potentially building their new park nearby the campus and taking away part of it’s facilities. Push back is going to happen anywhere, save for the Coliseum (probably). Reading the piece I have to say that those are some flimsy arguments (Vandalism and graffiti? where have I heard this before?) and the best of them can be worked through. The Athletic Fields could easily be replaced, and if the A’s were smart (and I believe they are) and Laney College is where they think it’s most likely to get done, they should include new athletic facilities for the Laney team as a part of their plan. Whether that’s renovating the existing sites at the College of Alameda, or something entirely different. The truth is that all of the potential sites have hurdles. They are pretty tall hurdles at Howard Terminal and Laney College. I believe the reason for the delay to date is because the A’s are working with the City to knock down as many challenges as they possibly can before making an announcement. @Jeffrey- gonna take a lot of free land and entitlements to buy the land, build a new ballpark and build new athletic fields for Laney too. A’s aren’t printing money- somewhere along the line the city is gonna have to cough up some money (either cash or lots of land) to make this happen- my guess is cost at this site with land acquisitions and replacement fields is about 700M+. coliseum already has an eir and with the other teams leaving in a couple of years the a’s could realistically announce the coliseum as the location right now if it indeed their choice. but the coliseum could be the a’s fall back plan where if both howard terminal and or laney are deemed just impossible to make happen then the coliseum would be the emergency double back up plan? i’d take either location, really don’t want the coliseum at all. spent what 50 years there since the a’s move to the city of oakland and you want to spend another 30-40 years at that location in brand new park that will supposedly transform the org? Yeah, I agree with you on preference. I was so surprised when they didn’t just announce “WE ARE BUILDING AT THE COLISEUM!!! !” Because, that is really what I expected. Kaval is a different animal than Crowley, who was really just doing whatever Wolff wanted him to do. Kaval could really be the new Andy Dolich, and that is great for us A’s fans. The proactive, think big mentality is like a lifetime of fresh air in a few months. Let’s just hope they make it happen! putting on my conspiracy cap here. but what if the a’s do announce they want to build at either howard terminal or laney. that would create imo a ton of excitement within the a’s fan base and if done in june, july, or august it overshadow the rest of the 2017 season in a way especially if the a’s aren’t contending as most expect they won’t. would there be as much excitement if kaval were to announce to the local media and a’s fan base, hey we’re building the new park at the current coliseum location? I think $700M is probably about right, but I have no detailed information that would support that. If the City is kicking down anything, it would be similar to the $200M they had pledged for infra work at the Coliseum. If they renovated the facilities at the College of Alameda, it’d be cheaper. I don’t think it’s fair to say Schaaf “lost” the Raiders. If the way to “save” then was to kick in $500-600M, she was 100% right to let them go. Of course, if Jean Quan had been a little more practical then pushing a complete pipe dream in “Coliseum City” the Warriors might have stuck around, but it’s hard to see the Raiders staying under any circumstance that didn’t come with significantly more than $$$$$$. The Warriors were pretty much out the door from their first press conference. That said, they did check in with Quan/Oakland on Coliseum City and that meeting has been mentioned a few times by Joe Lacob as why the shifted focus to SF (we will probably never know how true that is, it could have been a convenient excuse). distance from laney to the college of alameda via the posey tube between oakland and the island of alameda is just over 2 miles away or about a 5-10 minute drive depending on traffic. so that could definitely be a replacement level venue for laney college if the a’s built the new park at the current location of both the baseball and football fields. Let’s keep in mind that due to the terms of the cities’ ENA with Fortress, the A’s could not discuss the Coliseum land *without going through Fortress* until April 26. (Fortress had a 30-day post-relocation-vote-goes-through period to discuss alternative development of the Coliseum, which expired 4/26). That there has been no plan put forth yet is not surprising, as the A’s and the city have only had two weeks to actually discuss it. @ccctl… that is a damn good point. My guess is in one way or another the A’s organization are going to offer financial assistance of one kind or another to make Laney College athletics whole, if that’s where they ultimately land. Honestly, it could be the best thing that ever happened to the school in these days of educational budget crunches and cash-strapped JCs. As you mentioned, some people will complain no matter what. However, I wouldn’t be surprised if Laney College make out very well as far as negotiating shiny, state of the art facilities in Oakland or Alameda. I suppose that Laney College can sell its land for a lot more in an open bidding than selling it back to the City which then in turn somehow loan it to the A’s. Anyway even if the City is willing to pay the market rate for the land, we don’t know if monetary compensation of any amount is what the College could consider satisfactory. If it’s up to me, personally I wouldn’t, unless you trade me back another piece of land that is also adjacent to the campus. So in the end, would the City make it happen over the objection of the City (and, to a lesser degree, the expected objection from the rest of the nearby area)? With the loss of both the Warriors and Raiders, it is in Oakland’s interests to assist the A’s in getting their new ballpark deal done at the site of their choosing. If there are any legal challenges coming from NIMBY”s to attempt to block the A’s from building at their choice site, then MLB should begin to consider to allow the A’s to move to San Jose. Hopefully, the use of this leverage won’t be necessary. Always going to be some heat, no matter how air-tight the plan is. The Warriors had to cross legal hurdles to get to the point to where they were able to break ground in SF. this is coming from somebody from reddit who claims he knows somebody from within the a’s org so take it with a grain of salt. a few weeks back on 95.7 The Game Chris Townsend described the Laney site as “very doable” based on what he’d heard about the A’s plans. is howard terminal an easier go than laney? For a ballpark, Brooklyn Basin and Estuary Park were never going to happen. Laney would be cool (i.e. view), but politically won't happen. I'd guess that Howard Terminal is the site. Coliseum 2nd/back-up. Laney site has to contend with the college. Plus schools and a neighborhood literally across the street. A's won't want that opposition. Howard Terminal has heavy hitter Union Pacific and middle-weight Schnitzer Steel. Plus lots of small light industrial across the tracks. That said, the the optics are way better to be engaged in a battle with commercial entities than educational and residential. As far as a public entity land-owner: Port way more willing than college district would ever be considering excess capacity at the Port. Re: Howard Terminal timeline, Downtown Oakland Specific Plan/EIR prelim. draft Jan. 2018, formal draft July 2018, final adoption July 2019.
so if you go by that last tweet the earliest a howard terminal ballpark would open would be what? 2021 or 2022? i’d be willing to sit at the coliseum for another season or two if it means a park at that location over the current site but would the a’s themselves be willing to wait those extra couple of years knowing the revenue checks will be phased out over the next 4 years. I think this a guys opinion. Not really facts. Howard Terminal! Laney College! Coliseum! Go over every site with a fine-toothed comb. 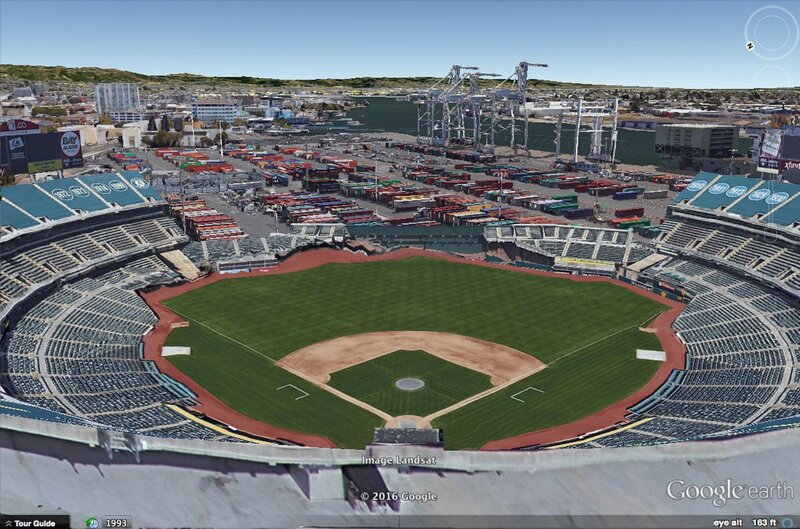 Say, with all this talk about sea-level rise, how about a new A’s ballpark on a barge! this quick interview was i’d assume done couple of months ago but was just posted recently when there was still debate going on where the raiders would end up at long term. we all know it’s las vegas now. but oakland city council member kalb did a quick interview saying that the coliseum will be redeveloped with or without the raiders. in all of this he didn’t mention at all the a’s in all this discussion about what’s the future plans are for the coliseum area. did he know back then that the a’s were looking elsewhere at either howard terminal and or laney college for the site for a new baseball park? Kalb is on the record previously saying the A’s should just build at the Coliseum instead of going after Howard Terminal. So who knows what the hell he’s thinking. a couple of links about the potential sites for a new park in oakland with their pluses and minuses for each in regard to parking and transit. pretty sure the a’s have made studies about these kind of issues but a nice rundown for those who won’t likely ever see those studies from the team. Also, that analysis is a little lacking… For example, saying that 10,000 people come via car because there are 10,000 parking spaces is laughable. Walk through the parking lot before a game, cars come on holding 3-5 people, not a single rider. Thanks for sharing these, I had never read them before and the authors clearly spent time thinking about what they wanted to present. I just finally had a bit of time to read both of these/do some checking on my own and I have to say… these are pretty bad analysis and I kind of think it is intentional and meant to make Estuary Park/Howard Terminal seem much more desirable than they really are. Here is the issue with Estuary Park: I looked up the measure that was passed to improve the park (Measure DD), in that measure the park is specifically called out as a “7 acre park.” This is the first reason why that site is unrealistic: It’s not big enough. Transit hardly matters for a site that you can’t really build a stadium on. But for some reason, they call it “11 aces” in their table… Not sure, maybe I am unaware of vacant land they are including as part of the park? But, excepting that and focusing on the transit portion… they claim Estuary Park is closer, as close as Amtrak in fact, to BART than Laney. That’s hogwash. Google maps walking distance on city street to Estuary park is .6 of a mile, it’s .5 to Laney. Couple that with the fact that they give Amtrak a crazy high value (there is no way 10% of transit riders to games are coming on Amtrak, maybe 5% tops) and you can quickly see that their conclusion is based more on their arbitrary decisions and bad data than on actual facts. If I were attempting something similar, I’d start by going to BART’s website and looking through their ridership numbers to understand how many people exit BART at Coliseum Station on a regular day, then how many on a game day (I’d look at the time frame from 2 hours before the game starts to 30 minutes after first pitch). This would give us a baseline figure for what percentage of attendees use BART. I wouldn’t even give any weight to Ferry riders. Each boat can bring about 350 people to the park (compare that the the 4 styles of BART train that can fit that many people in 1.5 cars, or a single 9 train BART car is capable of bringing 80% more people than one Ferry run and BART will pass through Lake Merritt every 10 minutes while about 4 Ferry’s will come in an hour). 350 people is less than 1% of the number of seats in the stadium. When you figure that about 30% of current ballpark attendees come via transit (almost all on BART) and do some math on how many folks would ride a boat to the game on average over the course of the season… the number of Ferry riders is infinitesimally small and not really a factor in determining how well a park is served by transit. It’s more of a marketing angle if anything. Similarly, I don’t know how many folks have ridden Amtrak to the Coliseum (I have, and also to Levi’s), but it is much more expensive than BART. That will keep the number of riders on Amtrak over the course of the season pretty low. Also, it takes a lot longer than BART does. You might see spikes on weekends as folks come from Sacramento and what not, but again… it’s really not that important. So, all of this is to say: The best served sites by transit are the Coliseum and Laney College and it has everything to do with BART and other methods of transit not really mattering in the big, big picture. As far as Howard Terminal goes… there are 7 off ramps within a 2 mile radius of both Howard Terminal and Laney College. There are way more places to park (garages, lots, etc) on the Laney side of 880 though the author seems to just be thinking about cars driving directly up to the stadium (which won’t be the long term plan for either Howard Terminal or Laney). There are not a bunch of trains running through the area at grade to complicate ingress and egress of pedestrians and automobiles on the Downtown side of 880. None of this seems to be taken into account in their scoring system, except for the number of off ramps. In summary, if it was appropriately rated with the correct distance information… Laney College would score 51.5 on rail (93% BART, 5% Amtrak) and Estuary Park would score 57.8. If we gave 2% for Ferry riders (which is generous considering that would mean you’d have 2 full boats of people at every game) Laney would be 54.5 and Estuary Park would be 59.4. I don’t even know how I would change the auto method, but I’d probably start from scratch because they don’t consider where people will actually park, just nearby land to be used as a parking lot (which is not a reflection of reality) and the number of off ramps within concentric circles. @ jeffrey I don’t think you can categorically state that Amtrak takes longer than BART, especially for the South Bay. I often take Amtrak to Raiders, A’s and Warriors games. Santa Clara to the Coli takes 42 minutes on Amtrak. In contrast, fighting my way during rush hour to Fremont then taking BART can be a two hour death struggle. It’s true that Amtrak costs more than BART, but they offer 25% discounts to Raiders and A’s games and there are other deals that can make a big difference (e.g. buy-one-get-one-free). The difference is also less if you factor relative distance into the mix. My extra cost of riding Amtrak from Santa Clara is somewhat offset by savings from not having to drive to Fremont (especially during rush hour). Also, Amtrak is a premium product. When you consider the relative ease of boarding; lack of crowding; comfortable, reclining seats; free WI-FI; tables; scenic views; power outlets and cafe and bar car, it’s well worth the few extra bucks over BART. I think the biggest limiting factor for Amtrak is the relative infrequency of trains. If they could somehow justify running a few extra trains, it could shoulder a much bigger share of the load than it currently does. So what percentage of people do you think will arrive at A’s games on Amtrak? jeffrey I think the main reason more people don’t take Amtrak to more games is the relative infrequency of trains. You’re typically looking at one train every 90 – 120 minutes, which means you really need to work around their schedule in a way you don’t need to do with BART. You also often are forced to make a choice after games of either missing the end of the game or waiting a while at the Coli for the next train. For Raider games I’ll just wait in the club afterward. Unfortunately, for A’s games this is not currently an option. And for night games there are no Amtrak trains to get you home to the South Bay, so it’s either Uber or a BART/Uber combo. Another big factor I think is the relative lack of marketing. The vast majority of people I’ve talked to about this are not even aware Amtrak service to the Coliseum exists, let alone it’s many advantages. To your question, I doubt Amtrak ridership at a new A’s ballpark will significantly increase unless they address the above issues. However, I think adding even one train each way (or even just adjusting the schedules of the existing trains) would make a big difference, especially if combined with some promotion. Having a southbound 10:15pm train would be nice. If the ballpark is at HT or Laney, Amtrak will add even more value for South Bay riders than it currently does, which should help. @ jeffrey I wouldn’t frame it that Amtrak is not that useful to get to A’s games. I find it tremendously useful, and much faster (and less stressful) northbound on weeknights even considering the infrequent schedule. I can catch a 6pm train out of Santa Clara and easily make first pitch at 7pm. If I drive to the Coli or drive to Fremont and take BART to the Coli, I need to leave by no later than 5pm and then I’m grinding my teeth for two hours wondering if I’m going to make first pitch. The lack of a southbound train back for night games is a minor nuisance, but not a deal breaker. Traffic is light by then, so Uber or BART/Uber both work fine. For weekend 1pm games it works fine as well. I like to get there early anyway, so a 10:15am train that gets me there by 11am is great. Coming home, depending on what’s going on in the game a 4:15pm train or BART/Uber work fine. I would frame it more that the limited schedule is a factor keeping ridership down overall. Not everyone is as flexible on their schedule or values comfort and relaxation as much as I do. Having said that an awful lot of people do, or would if they gave it a try. I’ve brought a lot of people up to the Coli via Amtrak for the first time, and most of them said they wouldn’t want to go any other way given the choice. So I think more promotion could make a big difference. I would agree more trains doesn’t seem imminent, but over the long haul I don’t think it’s unrealistic. In the meantime, even a 15 minute adjustment to the existing schedule could help optimize ridership. Cool. Frame it however you want. also if the a’s choose to build at the laney location you wonder if the team along with the city has talked with those who are building the brooklyn basin project which will be just a block or two away depending on what parcel of land the a’s would choose to build the ballpark at. brookyln basin which just began construction recently, at least it’s first phase of the plan, when it’s finished being built will be the largest mixed used project that the city of oakland will have built in a long time transferring the 60+ acre site into a new waterfront community. you can see the laney college athletic fields just behind the tower on the side side of the image above. you can see here how close the laney site is to the brooklyn basin project. Any idea what the plan would be for the Coliseum site if the A’s decide on another location? The access to BART and development potential seem ripe for something…. No clue, but I’d bet part of the development will be controlled by the A’s as a way to finance a park somewhere else. I have a question for either one of you, and please forgive me if one of you may have covered this already. Is it feasible (at all), to have the ferry service run from the lake down the channel (posable Laney college ballpark site), then out into the inner Bay to JLS and Alameda/SF. I’m guessing it’s too costly or can’t be done for some other reason, but wouldn’t that be beautiful? Of course an answer is not required, but any input would be appreciated. Sounds cool. I have no idea, but I’d start to try and answer that question by figuring out how deep the channel is to see if you could even fit a Ferry in the area. I am not as big on the Ferry as some ballpark supporters are. It’s really not an efficient way to get people in and out of the area. It carries far fewer people than rail and it takes much longer to get from SF to Oakland than BART. That said, I do agree that aesthetically it is damn cool to see boats pulling into the harbor. David Kaval for all the good will he is promoting does not understand commercial real estate like Lew Wolff did. Uncle Lewie for all his eternal greediness reviewed all these sites (Laney and HT) in and out and could not get a deal brokered that made sense time and money wise. I just do not see how Kaval is going to accomplish something of this magnitude in a city like Oakland known for ineptness (I.E. Raiders and Warriors) where Wolff who has built massive commercial structures failed? Why the A’s are not immediately jumping on the Coli site with the Raiders leaving makes me scratch my head unless for one scenario. Kaval/Fisher know full well they sat on the Raiders heads and that is why they left. The team stated they did not want the Coli site at all. Now with the Raiders gone, if the A’s announce they want the Coli site all of a sudden it will make them look really bad to all parties. They need to delay some more, let the Raiders leave in 2 years then announce the Coli site once it looks like “they tried elsewhere”. Only theory I can think of. Here is another one: Lew Wolff’s risk tolerance was too low. Not to beat a dead horse (ok I will), but your scenario assumes that Wolff gave a full faithful, and honest effort at these sites, that’s an assumption I have much faith in. That along with the fact that he was still holding out hope for San Jose, and still getting revenue sharing from the other owners. Those two factors could have made his risk tolerance even lower, but as I complained at nauseam back then, all Lew had to say was “It doesn’t pencil out”, and that was good enough for many of my wonderful friends here. Oakland 2009-12 < Oakland 2016-17. Simple as that. Also what ML said. Oakland has seen tremendous growth over the last decade, has a new Mayor that isn’t blowing smoke for political cover, there is no longer the RDA fiasco, there is no competition for City resources with the Raiders and Warriors out the door, and really that’s just a partial list. There are a myriad of factors, and a lot has changed over the years. We can debate the reasons and the varying degrees each factor played into why we are where we are today, but the good news is that we are getting closer to a new baseball only ballpark. To supplement ML’s point, given how long this has dragged out the economics have changed over the years. When this board was relatively new, I was a vocal skeptic of the viability of a new ballpark in Oakland for various reasons. However, in the more than a decade that has passed since then the East Bay has grown larger, wealthier and attracted more corporations. Local TV has outpaced premium seating as a revenue driver for MLB teams. Plus the A’s team value has increased substantially, giving them more resources to fund a project. There are a lot of reasons HT or Laney may look more do-able than they used to (not to mention a wiser choice for the long term than the Coliseum). Of course, but Wolff and his desire not to be in Oakland…that couldn’t be a factor as well, right? I never bought into this paranoid idea that Wolff had some kind of grudge against Oakland. It’s just that ten years ago it wasn’t an attractive place to build a privately-financed ballpark, especially compared to San Jose. 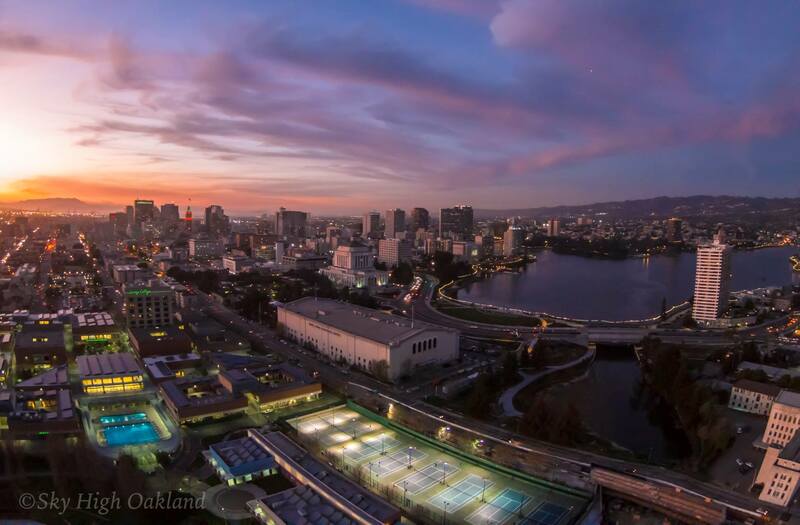 Now, the world has changed and Oakland looks a lot more viable. Yeah, I am not a believer in the Lew Wolff hates Oakland stuff. Lew Wolff loves money. He doesn’t care where the money lives. A businessman that makes that much money over a lifetime doesn’t care about our provincialism. I apologize my response to you was somewhat dragged into the prior commitments, between ML, Jeffrey, and myself. That being said, I for one never said Wolff hand a gauge against Oakland, nor do I believe one has to be paranoid to believe Wolff didn’t want to build there because he said it on more then one occasion. Everyone has the right to believe what they want, I don’t believe Wolff would have ever built in Oakland regardless of the changing circumstances. He made that painfully obvious to me. You are more then correct my friend. With both the Raiders and the Warriors well on their way out of Oakland, the A’s finally now have the leverage with the city to get a new ballpark deal done on the site of their choosing. The Laney site offers by far the most surrounding development and transportation infrastructure already in-place as compared to the other proposed ballpark sites. I believe that Oakland officials will be working with the A’s to resolve any issues with the Laney site such as land acquisition, the relocation of the Laney Collage athletic/administration facilities, etc. Also, and if need be, MLB always has San Jose in their back pocket to expedite the process. @ llpec I agree with the premise of your post. While I have zero ‘inside information’ on this, it seems only logical that the Mayor has clout/leverage to get things done. She’s certainly more popular than the ‘in over her head’ disaster of a leader Jean Quon. And while I know that there are always those residents that will be ‘anti’ sport team I also believe the local business community would absolutely clamor for a downtown park that would be a boon for the local economy. Robert Gammon is reporting Laney is in the lead and A’s have concerns about train tracks near JLS, Gammon is citing multiple sources and claims Coliseum is distant third option, estuary not even a fourth option, it’s dead. nice but i won’t truly believe anything until i hear it coming out of kaval’s mouth hopefully this year. Update May 10, 6:05 p.m.: After this story was published, A’s President Dave Kaval called and apologized for not returning two phone calls for this story. He also disputed that the Laney College site is now the team’s leading choice. He reiterated that the Coliseum is still on the table. He said the A’s have done polling on all three sites, and in each one of those surveys, pollsters have identified either Howard Terminal, Laney College (which the team refers to as Lake Merritt), or the Coliseum as the top choice in order to deeply probe residents on their feelings about each one. I had just read this and was coming to paste… the most interesting part is that they seem to favor the parcel across the street from the athletic fields. And the Laney parking lot as a potential ballpark village. Also the city willing to pitch in $200M for infrastructure. I think this is a winning formula. Get ‘er done guys. from what i’ve read and seen speculated recently from other a’s fans both here and other places online i would’ve thought the ballpark village was going to be where the athletic fields were so it could be some sort of buffer the park would have from the two schools across the street. possibly build condos where the football field is right now which is the part of the playing fields that is directly across both the elementary and high school and the restaurants/bars and other parts of the “noisier” elements of any baseball village where the baseball diamond. that way the entertainment parts of the village area would be across the street from where the park will be reportedly built. basically where the college administrative builds are currently located just next to the 880 and just a block or two away from the brooklyn basin project that’s being built up within the next decade. then the current laney parking lot you’d get a massive parking garage built to help ease the parking concerns both for the college and for a’s games if they were to decide to build at that location. That is what I would have thought, too. But Robert Gammon has real sources that do know the plan. It sounds like the A’s have one for Laney, the City prefers HT but there are no plan details mentioned. I have never thought HT was a good idea from many angles (cost, transportation, differentiation from AT&T Park, etc). Pure speculation… maybe the recent upgrades to the Athletic Fields and procedural hurdles mentioned in that Laney Tower opinion piece were hurdles the A’s decided not to attempt to tackle. so where’s the parking going to be then if the ballpark village will be built upon the current laney parking lot? now we don’t know how big the ballpark village will be but even a not so big one will take up a good chunk of the current parking lot at the college. i don’t know if there are other surface parking lots near that area that would be adequate enough to make up for the amount of parking lot spaces that the village would take up. unless lets say half the current laney parking lot will the space for the village and the other half they’ll try to build up a massive parking garage structure. but even then you’re still going to lose most of the parking for the college for a couple of years when the construction is taking place right for the three projects potentially in the ballpark, the village, and the parking structure. that’s something i think the college would balk at. I think we are speculating a lot on things we don’t quite understand yet. Let’s see an actual site plan. I think there is enough room to make it work, but I have a version of “it” that isn’t really “it” in my head. Here are a couple of articles in regards to the two sites done by the A’s blog athleticsnation last year. nice job. you posted that laney is your favorite site, i’m guessing you still feel that way 5 months later? still think howard terminal has the chance to be a game changer and iconic but laney has a chance to be pretty transformative itself although imo not as much as howard terminal but in terms of feasibility it could be much easier and especially cheaper to accomplish. Then I think about the juxtaposition of two similar stadiums in the same metro, one in a city with a lot more cache (in region and out of region) and the only way the A’s can compete with that in an average season is to be canned vegetables. AT&T will be the Del Monte brand canned peas, Oakland will be the Safeway Select version… in other words, they would have to compete entirely on price. Which is great for me, cause cheap tickets… but, it is not so good for the revenue thing I mentioned above. Though I am 100% on board with either if that’s what the City and the A’s can make happen. would be a pretty good view of the backdrop at night at the laney site. still not as iconic imo as what could happen at howard terminal with the potential cranes and estuary with boats whizzing by but i’d be happy with either location honestly. can’t wait until the a’s do release some renderings of what their new park will look like especially if it indeed ends up being at one of these two locations near downtown/waterfront. i wonder if the a’s would try to incorporate the lake merritt channel with the park? i brought up the idea of whether or not kayaks could be around the park if the a’s were to build at howard terminal but later notified that wouldn’t be allowed to happen. but the lake merritt channel does allow kayaks so that could be part of the “atmosphere” around the park like what we see across the bay at at&t but at a small scale of course. 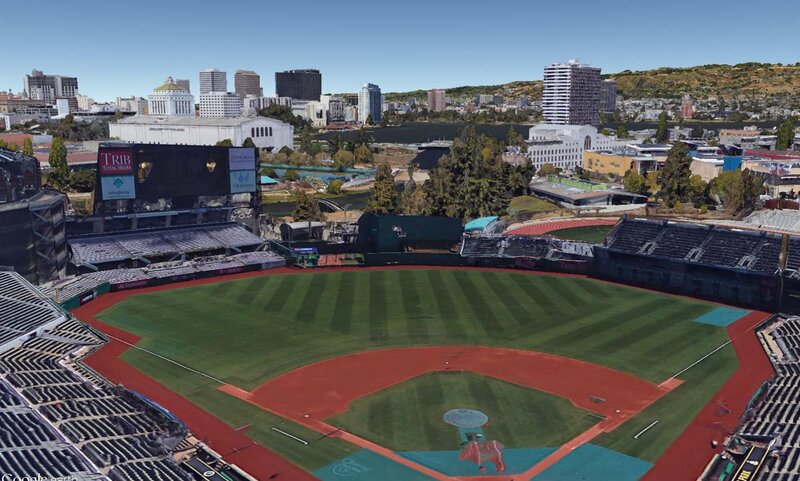 here’s a fan rendering of what a a’s ballpark built at laney could “feel” and “look” like using pnc park in pittsburg standing in for an a’s park at that spot. Did you make this picture? Can I instagram it? i didn’t make as i’ve seen it online for the past year or two. I’m skeptical on whether it can be done, but can’t say that isn’t a sweet view. Better than HT’s actual view. here’s another fan rendering of what a park could look like at howard terminal. This ‘shop and the other one are absolutely hideous. Stop posting these in the comments. Start a separate blog if you want to post these, don’t deface my site with this. Is that an FAA limit like they had in San Jose, or is this just a city zoning thing? It’s a city zoning map.